There are so many juicers — perhaps too many — on the market today. It can be a very tedious process to sift through juicer reviews. How can one make sense of it all? You don’t want one that’s going to break after a couple months, but you probably don’t want to drop a couple grand on a Jamba Juice like super blender either. Have no fear, EcoKarma is here. We’ve done the heavy lifting for you. We’ve broken each juicer type into three categories: compact, masticating, and commercial grade. For each category, we show you an overview of the absolute best juicers. We scrutinize the juicer from it’s capacity right on down to the very mechanisms that slice, dice, and juicify. 1 What’s the Deal with Juicers? What’s the Deal with Juicers? Why buy a juicer? There is a variety of reasons. Usually, people fall into three general categories. One: they want to make delicious juice from fresh fruit and avoid overpaying at the grocery store for gallons of it. Two: you’re a health-conscious individual and are looking for a fast and easy way to consume vegetables and fruit(and whatever else your clever noggin can think to throw in there). Three: you’re looking to lose some weight and/or detox and you’ve heard of the ultra effective juice diet. If you fall into one or more of these categories, or one that we haven’t mentioned, our juicer reviews are the place to go for all of the information you need to find the best juicer for your lifestyle. First up is our comparison chart of the best juicers currently on the market. The table is sorted in the same order as our review section for easy reference: first by Category, and second by Price from Low to High. Note that our Price and Popularity scale are both on a 1-5 range (5 being best score). There is something for every budget here! For mobile users, you will see a compact list instead of the full table for easier viewing. No worries, it still has all the info just in a mobile optimized format. The compact juicers juicer review section are the familiar machines for everyday use. These are the type of juicers that most people think of when they think juicer. The compact juicer categories are those which can easily fit on a countertop space and be stored for later. The brand Breville is known for putting durable small kitchen appliances in kitchens that will get the job done. The story is no different with their Compact Juice Fountain, which easily makes the list for best juicers. With its compact size it will not be in the way on countertops, and will fit easily into cupboards. The 700-watt motor packs a punch, juicing at 14,000 RPM so that you any user can know they are getting the most juice out of those fruits and veggies. The stainless steel appliance comes with a custom cleaning brush and is backed by a 1-year limited warranty. This is definitely a great starter machine for those who are new to the juice diet, or are looking for the best juicer on the market that won’t break the budget. Though many remember the Magic Bullet as being just another infomercial impulse buy, the company has definitely stepped up their game with the recent upgrade of the NutriBullet system which is why it definitely belongs on our best juicer list. For the on the go individual that is new to the juice diet, this juicer/blender is no doubt the best choice to get you started. Minimal time commitment and cleanup are just a part of what makes this appliance so appealing. The 12 piece set comes with three different blades in order to custom-pulverize whatever food it faces. Prepare for a pulpier juice blend from this unit, but the 900-watt motor is much more powerful than the older version and is greatly improved at breaking down fruit, veggies, seeds, and more! It’s definitely worth paying the small extra for the new model, and if you’re unsure how you feel about the juice diet it’s a great way to dip your toes in the water and still have an extremely practical (and nifty!) appliance. Sometimes straying from the buzzword name-brands is an OK thing to do. Such is the case with our next best juicer by Jack Lalanne- the Fusion Juicer is a juicing monster with its extra-large chute, roomy pulp collector and powerful blade it extracts all the vitamins and nutrients that are vital to a successful juice diet experience. While the Fusion Juicer is not accessible to making juice in large quantities, we recommend it to the individual juicee looking for a great way to start juicing with limited pulp and lots of great flavor! This Cuisinart rock and chopper is a 1000 watt 5 speed juice extracting machine. Knowing your machine and what it can handle will make a huge difference in what kind of quality juice you are producing. This particular Cuisinart model gives the user an opportunity to know it better with an easily adjustable 5-speed motor. This is by far one of the best juicers on the market that Cuisinart has put out recently. It is drip proof and extremely user friendly even with its 1-liter pitcher design that can be stored or poured without issue. This stainless steel Omega Juicer will surely put the end to all of your searching for what the best juicer on the market is. If longevity is what you’re looking for in a juicer than that’s exactly what you’ll get with this one. This particular model is great for the juicer that integrates the juice diet into a more regular eating schedule. In other words, this is not an every-day juicer but more like a few-times-a-week juicer. The Kuvings Centrifugal Juice Extractor allows your busy life to continue with a fresh glass of juice in your hand. This 350 Watt powered two speed juicer uses a 3D mesh juicing screen that cuts and grates the contents into a fine pulp resulting in a wonderfully smooth juice. As you become more serious about your juicing, remember that maintenance and cleaning is vital to keeping your juicer working sharp! The Kuvings is no exception to that rule, and will continue working to help achieve health goals with the juice diet, so long as it is cleaned and maintained. Previously known as the Acme Juicerator, this commercial grade juicer is one of the best. 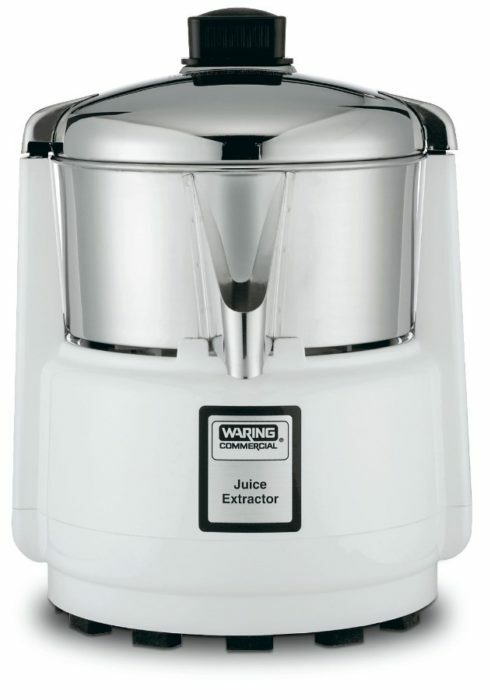 Fact: though now produced by Waring Co. the Acme brand stays true to form with this best in class juicer. A 550 Watt vibration free motor and stainless steel internal mechanisms and blade make this round beauty quite the extractor. The last two centrifugal juicers both come from the one and only Breville. This particular model has a unique dual titanium discs that can really get to the smaller and softer pieces of your fruits and veggies in order to get the best possible juice and nutrients out. The 3” feed tube can process large chunks and whole small fruits which slices prep time in half. For daily use, and those looking to truly commit to the juice diet and a healthier outlook on life, this model is the best juicer for the job. Hopefully you’ve checked out some of our fresh juice recipes and juicing recipes for weight loss pages, and maybe some of our healthy smoothie for weight loss recipes as well! If so then you’re already on the right track for a healthier you! We’d like to share this last Breville juicer with you because it is a 2-in-1 system that is going to tackle your juice diet and any healthy smoothies and protein shakes that are in your future as well! With 5 variable speeds and wide chute, it can process a plethora of fruits and vegetables without preparation. Having a high quality dual purpose system like this is going to save you in the future from having to replace two separate appliances due to wear and tear. This product is built to last, and it will continue blending and juicing for you until you’ve reached your health goals and beyond! This is another great option for a countertop juicer specifically for a beginner. It’s a low investment, so you can try things out to see if juicing is something you can commit to. It has a compact design, so it will fit most places. The steel cutter and strainer will work through most fruits and vegetables with ease. Many of the parts are dishwasher safe, so that will simplify the process. The one thing to know is that this is a lower quality juicer, it fits the price tag, but if you want to start juicing daily you’re going to want something with more punch. The Hamilton Beach Juice Extractor is another good beginner option. It’s coming in at under $70 for a 1-Speed 800 Watt Motor Model. The extra large pulp bin makes it easy to produce plenty of juice in one sitting. It comes with a serving pitcher, as well. Like many of the compact models, there are dishwasher safe parts. It’s important to wash all parts after each use to prevent the growth and spread of bacteria. It fits whole food, and will help you start on your juicing journey! The masticating juicer reviews section is a category all on its own. Using a gradual crushing action, masticating slow juicers produce juice that lasts much longer than juice produced by centrifugal juicers. It can easily be forgotten that faster is not always better, and while we love the centrifugal juicers because of how well they perform is such little time, one cannot overlook the benefits of a well-made masticating juicer. Instead of just chopping and dicing fruits and vegetables to collect juices, masticating juicers also use pressure in order to drain pulp of extra vitamins, minerals and nutrients so that you can be assured that you are getting the most you possibly can out of your juice diet routine. Take a look at some of the masticating styles of the best juicers! Another of our best masticating juicers for beginners is the slow juicer that comes from Big Boss. If you’re not looking to commit just yet to the bigger-buck juicers, than this one will do more than enough to get you hooked on juicing! This juicer works continuously for up to ten minutes, and has a reverse function just in case anything gets clogged up. It’s easy to clean and again, takes up small space, but you won’t forget that it’s there- because you’ll be using it all the time! Our recommendation for those looking to experiment with a masticating juicer would be to look no further than Hurom! Their patented system ensures that the juice you are getting tastes natural and are chock full of the nutrients your body needs. They have recently upgraded their look, and quality, which we give two thumbs up. Virtually silent, this system is high powered enough to juice almost anything, yet is compact and affordable. If you love what you get with this low-grade juicer from Hurom, then you can always stick with what you know and later graduate to one of their higher-grade machines that also made the list for best masticating juicer! You’ll begin to notice many similar brand names throughout this list- companies like Kuvings sure know how to put the best juicers on the market. This quiet and low speed machine uses advanced masticating technology in order to produce the best juice. The heavy-duty juicing screw within winds through fruits and veggies in order to break them down for as much juice as is possible. This particular Kuving model also comes with six other nozzles for other forms of food processing and is extremely easy to clean. NutriChef’s Slow Masticating Juicer Extractor is a new addition to our best juicers reviews list. We love the sleek look of this stainless steel upright juicer, and the strength that it has to get the most nutrients out of the fruits and veggies you need is more than impressive. Scientifically tested, this juicer can process fruits at a slow rate, ensuring the temperatures won’t rise and destroy potential nutrients. Plus, the masticating NutriChef is a fair price, and easily affordable for someone new to the juice diet. It’s time for another Hurom! Easily making our best juicer list twice, this brand makes an even better cold-pressing system for someone really wanting to take juicing to the next level! The durable motor in this model comes with a 10 Year Warranty and patented technology to get you on your way to juicing like a professional.It is great for everyday use, and is much faster than some masticating juicers as it features a self-feeding auger. This vertical masticating juicer is quiet and clean and will be great for any run-of-the-mill juicing that needs to get done. A clean white with a light green handle finishes this juicer off nicely. Hurom’s masticating juicer also comes in black and silver styles. While the name is a mouthful, there won’t be much need to say anything besides “best juicer” when it comes to this Omega appliance! It is capable of juicing even wheatgrass at an incredibly high yield and can handle almost anything you throw into it and result in delicious juice! Perhaps not as snazzy as some of its competitors, it’s heavy duty build can juice just about anything with ease. The convenience factor of this model is huge- it’s small yet incredibly efficient and has that trendy 10 Year Warranty as well. Definitely the best masticating juicer you will get for your money, this thing will last you forever. Look beyond just the appealing design of the SKG Wide Chute Juicer, and recognize it’s Cold Press power. The juice that this appliances produces has minimal oxidation with less pulp than ever before. The high yield results boast getting 85-90% of the juice of an orange. That’s quite a bit more than you could get out with your hand. The piano varnish and sleek design will stay modern on your kitchen counter, and help keep it clean. The parts are easily removable for cleaning, and are covered by an extended warranty. The commercial juicer reviews section are generally models that fall above the $1000 price point (for heavy and business users). So maybe you are looking to add the best juicer you can find to your small business. We’ve thrown in two of the best commercial juicers we could find that will serve your customers well at your food truck or café! What is the absolute best juicer of 2018? If you want the best of the best, the Super Angel does it all. If you want the best money can buy here it is. Our recommendation for best commercial juicer of 2018 goes to this stainless steel beauty from Super Angel. More than just its dashing good looks, this machine’s twin gear system will grind up whatever you throw it’s way to produce a premium juice drink that will make you fall out of love with every other small kitchen appliance. It’s backed by a 10 year warranty on the motor and parts, so never fear about cost — you’re getting assurance that it will perform to the highest standard without fault! It’s the best juicer around so why not make it the winner? This user friendly machine easily tops the list for best commercial juicer. It’s stainless steel parts will do the job right and last forever. If you’re wanting to send a positive message about the juice diet to your customers than this is definitely the best way to do it. The price is high, but it gets the job done right. Even if you’re just a whole family of juicers looking for the best juicer on the market that can handle all of your juicing requests- this is well worth the investment! For more information on juicing, you can check out our main juicing page. Have you heard of the juice diet? Let’s be real. The juice diet is not for the faint of heart. It will leave you craving solid foods. On the other hand it’s healthy, easy on your body, and will help you shed pounds faster than almost any other diet out there (barring the starve yourself and eat 2 crackers a day diet). Whether your vegetarian, vegan or something else entirely, you can participate. By following the juice diet, you are changing the rules of the game. Most of your caloric intake will be composed of liquids rather than solid foods. The one thing any devout juice diet follower needs is a trusty juicer. After much debate, we have identified the best juicers on the market. No matter what your budget or juicing needs entails, there is a juicer with your name on it. In this article, we take a comprehensive look at the healthy habit of juicing. We will cover the juice diet, juicing recipes, and a juicers review section where we make detailed comparisons of the best juicers of 2018. What does your average juice recipe look like? To give you a general understanding of what to expect when embarking upon a juice diet adventure, take a look at some of our 2018 favorites from Youtube Health Guru KarolinasKrafts. We’ve done our best to summarize them all for you below. Making a small investment in a high-quality juicer is one of the best things you can do for your overall well-being. Raw juice is teeming with micronutrients that most individuals do not receive from their modern diet. Drinking fresh juice is almost like getting an intravenous injection of vitamins, minerals, and enzymes. Drinking juice first thing in the morning will give you a natural boost of energy without turning to stimulants such as coffee. Fruits and vegetables have very low-calorie content. Unlike carbs, fats, and proteins your really going to have to try hard to overdo it. Let’s be honest. Not all of us enjoy consuming a whole plate stacked full with broccoli and brussel sprouts for a quick snack. It is much more manageable (and quicker if you want to gulp it down and power through) large servings of fruits and vegetables. Juicing is the most efficient means of getting your fruits and vegetables. Juicing is a habit that can be acquired at a relatively low cost. Obviously the biggest investment you’ll need to make is a quality juicer. Other than that, you have to eat already, so why not spend a larger portion of your grocery Bill on vegetables and fruits. Since the juice is already in liquid form, it doesn’t need to be broken down by the stomach. The vitamins and minerals will go straight into your system. Nearly all health authorities recommend 6 to 8 servings of vegetables a day but how many of us actually hit that target. Juicing is a great way to easily hit those daily targets.